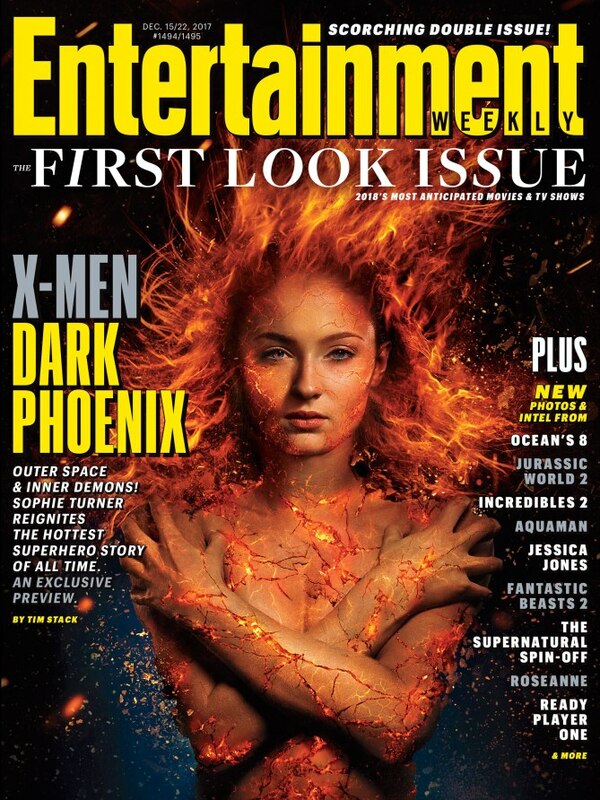 As part of Entertainment Weekly’s massive 2018 preview, the magazine also used today to offer fans a first official look at another major comic book sequel, X-Men: Dark Phoenix. Simon Kinberg, who has been around the franchise for years as a writer and producer, steps into the director’s chair for the first time on quite possibly the biggest X-Men movie ever made. For his first time behind the camera, Kinberg is tackling a story he first tried in X-Men: The Last Stand, which unfortunately is considered in the category of bad comic book movies. But with the title of director in front of his name now, Kinberg seems to have been given a bit more freedom this time around, as the X-Men franchise will be doing something it’s never done before, going to space. Reason why? That’s where Sophie Turner’s Jean Grey will be hit by a solar flair that results in the awakening of the Phoenix, the very thing that will be at the epicenter on the film. EW’s spread of the film also revealed that there will be a “major twist” halfway through the film, which could come in the form of death as one of the new images shows Professor X (James McAvoy), Beast (Nicholas Hoult), Storm (Alexandra Shipp) and Cyclops (Tye Sheridan) in a funeral setting. The set of stills also gives us our first look at Jessica Chastain’s villain, who was originally thought to be Lilandra, but still isn’t confirmed to be so. EW says her character is “an otherworldly shapeshifter,” which sounds like Lilandra. While no official confirmation has been announced surrounding the villain, it would make sense for it to be Lilandra as she plays a big part in the Dark Phoenix arc from the comics. Check out the new images below and after doing so, leave your thoughts and opinions in the comments section! Are you excited for another X-Men sequel? Will they get the Dark Phoenix arc right this time? Also starring Jennifer Lawrence, Michael Fassbender, Kod Smit-McPhee and Evan Peters, Kinberg’s X-Men: Dark Phoenix hits theaters on November 2nd, 2018.